We all know the number of consequences that can happen when a pet dog, cat, or bird gets out and has the chance to run around – but have you ever wondered what a goldfish would do if allowed to escape its bowl and explore the world? Studio diip did, and so the Fish on Wheels project was hilariously brought to life. The device is designed to let a typical pet fish dictate where it goes by swimming in that direction. 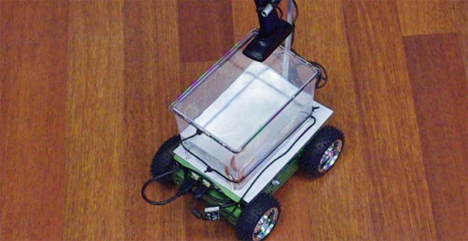 It consists of a tank of water attached to wheels, a digital camera mounted above the tank, and a tiny computer and micro-controller. The camera sees the fish’s position in the tank and which way it is moving, then steers the little water-car around in that direction. 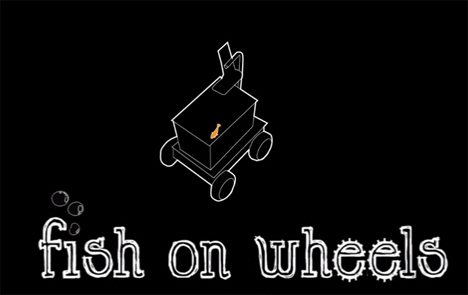 While not entirely a serious project intended to actually be used in homes, the Fish on Wheels experiment shows that the technology used in the setup doesn’t have to be limited to the usual robotics projects we’re all used to seeing. It’s a fun demonstration of how technology can be used even to empower a fish – but whether the fish is smart enough to realize it’s driving the vehicle is entirely a matter of speculation.